Help CentreSuperControl AGENCY features Commission reportingHow can I report on commission taken on specific extras? 1. Go to Agency > Commission codes. 2. Enter a name eg. Dogs (the name should match your option/extra that you take commission for). If you integrate with Sage accounts you may also want to add a nominal code. 4. Go to Properties > Booking options. 5. Click the option name eg. "Dogs". 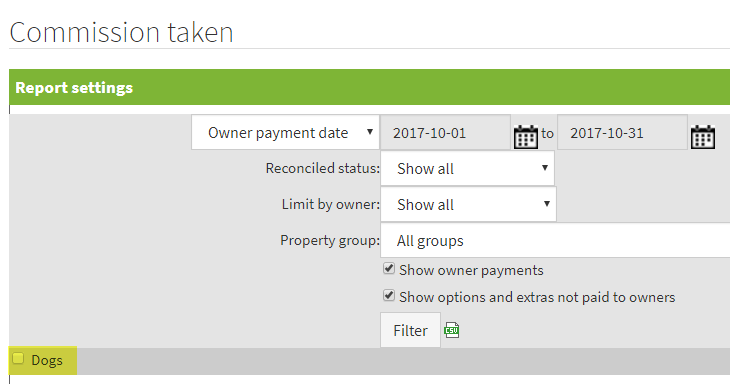 If no properties display in this pop-up select “All properties” from the drop down. 7. The page will auto-save so you can now close this window. 8. You can repeat this process for any other options that you wish to report on commission taken. 9. Go to Agency > Reports > Commission taken. 10. You can specify the date range, and choose to include only specified options, eg. You only wish to find out how much commission you have taken during that month for dog fees. Prev: How can I change my commission amount? Next: How do I pay myself commission?